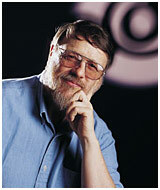 Ray Tomlinson ’63 received the George R. Stibitz Computer Pioneer Award from the American Computer Museum in April 2000, almost 30 years after he wrote what has been called the “killer application” of the Internet. Credited with inventing network electronic mail, Tomlinson is the man who put the @ sign in e-mail. In 1971 he was an engineer for Bolt Beranek and Newman, which had won the contract to create ARPANET, a communication network that would allow scientists and researchers to share each other's computer facilities. While investigating ways to use the network, he hit on the idea to merge an intra-machine message program with another program developed for transferring files among the far-flung ARPANET computers. What he did next secured his place in communications history: He chose the @ sign to connect the user name with the destination address. Unforeseen at the beginning of ARPANET, Tomlinson’s creation of e-mail became the future Internet's most popular application.